As the days get warmer and flowers begin to bloom in San Antonio, you don’t have to go far to be surrounded by beautiful flowers. Escape to nature without ever leaving the city! Visit these two beautiful gardens! The Botanical Garden in San Antonio is unique in that a large section of the Garden replicates different regions of Texas. Plants native to the Hill Country, South Texas Plains, and the Piney Woods along the Louisiana border are used to recreate these different regions. Old cabins, one belonging to the Schumacher family from Fredericksburg, can also be found along the nature trails. You can find yourself surrounded by nature, strolling around a lake, while being in the middle of a bustling city. Families often bring snacks and find a bench in these peaceful surroundings. In addition to the nature trails, the Botanical Garden has several conservatories for cacti, ferns, palms, and more. One section of the Garden is currently under construction until 2019. It will be worth a return visit when the fountain area is reopened, not only for the beautiful display, but for the Rosella Coffee Shop that is being built. (Check out my post of Coffee Shops in San Antonio for other Rosella locations–coming soon!) The best time to see the Rose Garden is late spring. I was there in mid-March and the roses were not in bloom yet. Newer sections of the Garden include the Family Adventure Garden and a Culinary Garden. Both additions make visiting the Garden a learning experience for the whole family. Its amazing how beautiful lettuce can look among flowers. For more information on the Botanical Garden, including events, click here. Parking: The small parking lot is located off of Alpine. If you drive too far, turn around in the Zoo’s parking lot. A Photography Permit is required if you plan on having a photo shoot in the gardens, otherwise feel free to take pictures. If you’re craving more nature after enjoying the San Antonio Botanical Garden, make a stop at the Japanese Tea Garden. The main entrance is located off of Alpine and N St. Mary’s and has a traditional gate with an interesting name carved into it. During the 1960’s the Japanese Tea Garden was operated by a Chinese-American family and it was known as the Chinese Sunken Garden – hence the name on the entrance gate. The Garden was built inside of an abandoned quarry in the early 1900’s. Today it is listed as a Registered Texas Historic Landmark and included on the National Register of Historic Places. If you’re hungry, you can grab a bite to eat at the Jingu House. Or stop here for a cup of tea. It is a tea garden after all. The cafe has its own history to tell. Originally, it was known as the Bamboo Room, operated by a Japanese-American Artist. Sadly, due to anti-Japanese sentiment during WWII, he was evicted and the gardens became the Chinese Sunken Garden. It wasn’t until 1984 that the park was rededicated as the Japanese Tea Garden in the presence of the artist’s family. The tea room is named after the artist: Kimi Enzo Jingu. If you’re coming from the Zoo, there is another entrance off of Tuleta Dr. and Alpine. The trail goes through a chain-link gate. If you enter from this direction, follow Alpine road to the top of the gardens for a view of the downtown skyline. But that’s as far as the road will take you and you’ll need to turn around to enter the garden. 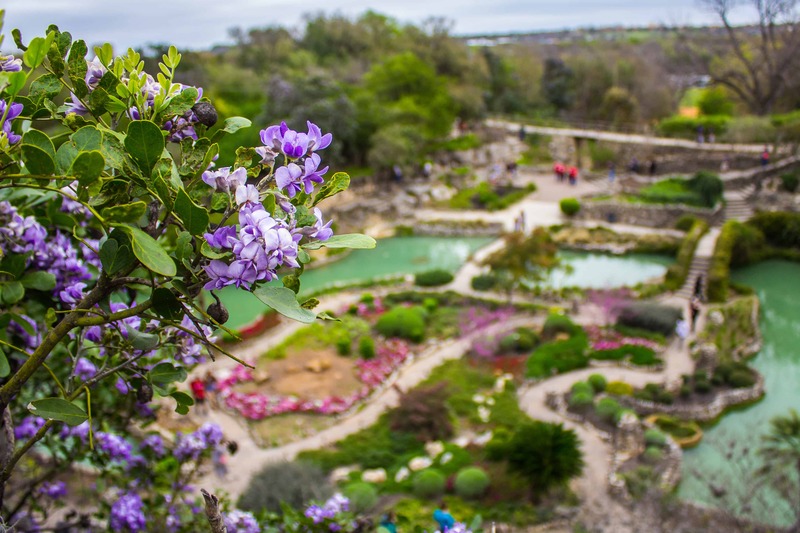 Where is you favorite place in San Antonio to see flowers in the spring? Share in the comments! Want to be surrounded by more flower? Check out my post on Lady Bird Johnson’s Wildflower Center just outside of Austin, Texas! It’s the perfect day trip from San Antonio.